Moment of truth time…have you ever heard of Clarified Butter before? 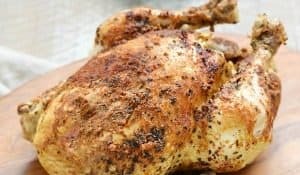 I bet you have heard the term, but have you ever made it yourself? You may be wondering why you would even want to make your own Clarified Butter, lol. I have always heard that regular unsalted butter is lactose-free and I have personally never had any problems with eating it….. Unfortunately, that does not work for Paleo and Whole 30 diets…all dairy must be removed! I am not looking to break the rules on my second day of Whole 30, so that is exactly what we are going to do today…we are going to make Clarified Butter. 🙂 Don’t worry, it’s super simple!! 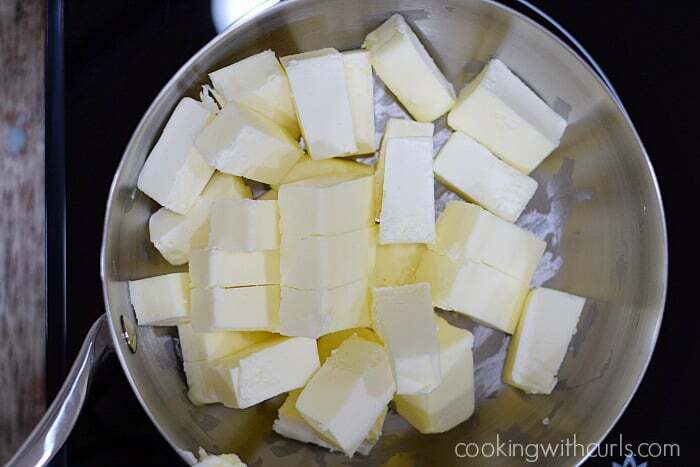 Cut butter into cubes and place in a medium-saucepan….. Melt the butter cubes over medium-low heat without stirring…..
White, foamy dairy solids will float to the top as the butter simmers. 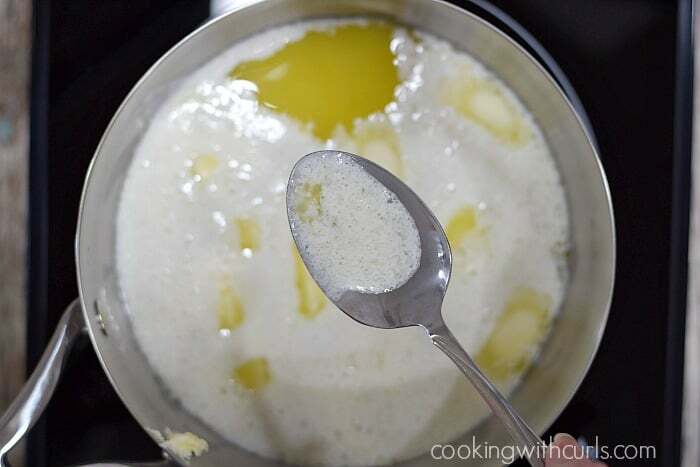 Use a large spoon or ladle to gently skim the dairy solids off the top…..
leaving the clarified butter in the pan….. Discard the dairy solids. 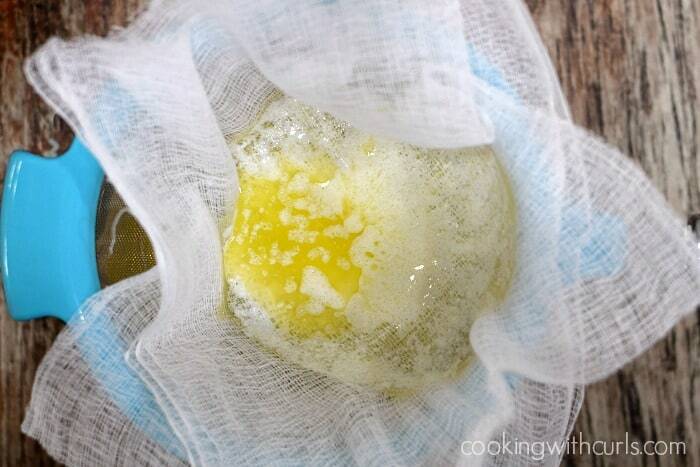 Strain the clarified butter through cheesecloth into a storage jar, or large measuring cup….. Discard the cheesecloth when finished. 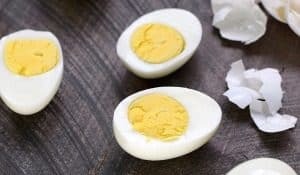 Allow the clarified butter to cool before storing…..
Store in the refrigerator for up to six months, or at room temperature for up to three months. The top image is at room temperature, you will notice that it is creamy. This Clarified Butter has been chilled in the refrigerator, so it is a bit stiff….. Pick a good quality, organic unsalted butter whenever possible…such as Organic Valley or Kerrygold. 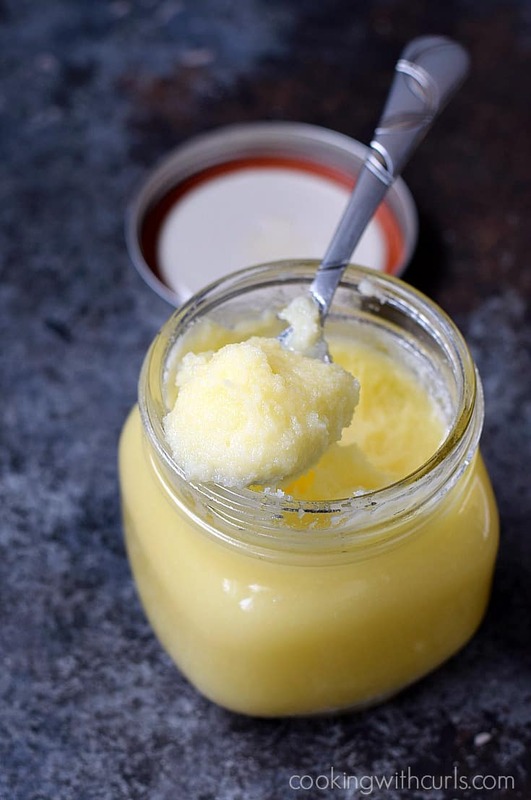 So you may be asking yourself… Self, what is the difference between clarified butter and ghee? 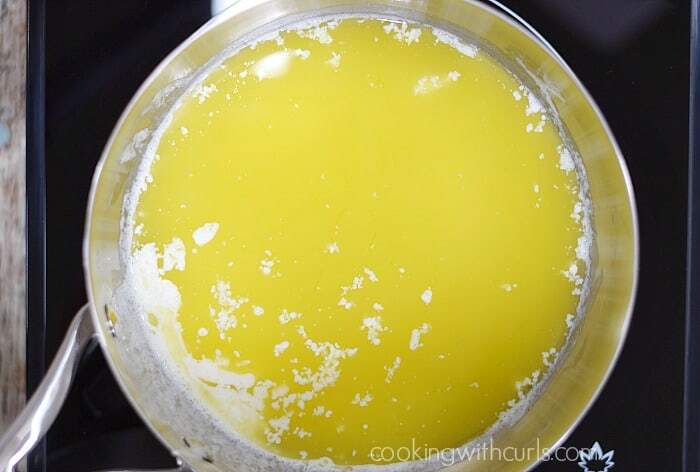 That’s a good question self…Ghee is actually clarified butter that has been simmered longer until the milk solids begin to brown, clump up, and fall to the bottom of the pan. It has a sweeter, nuttier flavor than Clarified Butter as well. 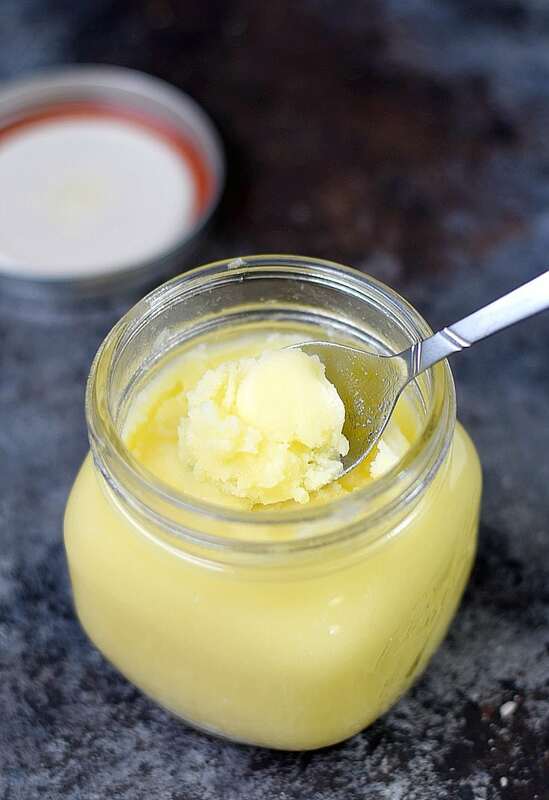 This Clarified Butter is so easy to make, you can always have some on hand for your favorite Paleo, Whole 30, and Dairy-free recipes! Cut butter into cubes and place in a medium-saucepan. 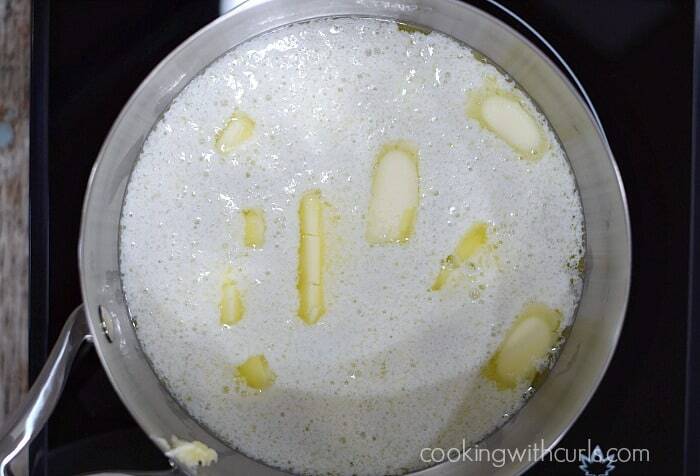 Melt the butter cubes over medium-low heat without stirring. White, foamy dairy solids will float to the top as the butter simmers. Use a large spoon or ladle to gently skim the dairy solids off the top, leaving the clarified butter in the pan. Discard the dairy solids. 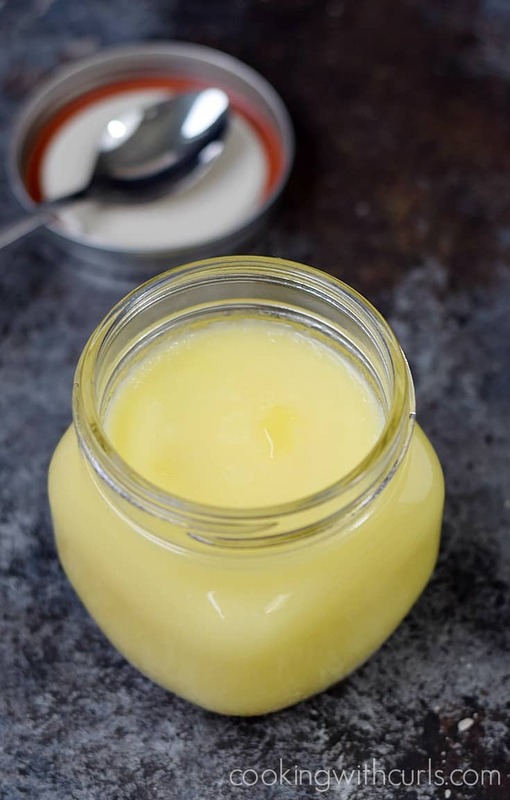 Strain the clarified butter through cheesecloth into a storage jar, or large measuring cup. Discard the cheesecloth when finished. Allow the clarified butter to cool before storing. 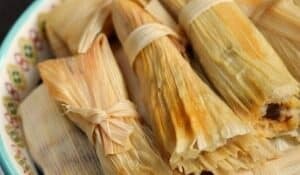 Store in the refrigerator for up to six months, or at room temperature for up to three months. So I wonder – does it make butter healthy? AND Can I use it for baking this way? I’ll have to do some research on these things. I’m curious, does clarified butter taste like butter? Can you use it in baking or is it just for spreading on bread, etc? Thanks for piquing my curiosity by sharing at the #ThisIsHowWeRoll Link Party.